This idea has already be written about by other bloggers, but it is something I had personally been thinking about for a while. 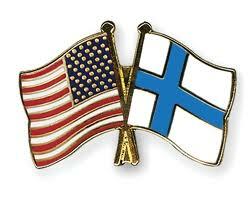 There are many differences between the American home and the Finnish home, some obvious and others subtle. I thought it might be interesting to discuss a few of them for this current blog article. I have mentioned this in a much earlier blog entry, the biggest difference is the size of the home. Many Finns live in homes with their families that are around 100 square meters, which is about 1,100 square feet. You typically don't see homes more than 175 square meters ( 1,900 square feet). Of course, there are bigger and smaller homes, but they aren't the standard. There are 2 reasons for this that I can see: 1) Finns are generally more efficient than Americans, they are wise with the space they have and do not need tons of extra "wasted" space. 2) The Nordic weather means that you need to heat your house and it would be very costly to heat your 3,000 square foot mansion for 5-6 cold months each year. :). The home we are living in now is a bit smaller than our home in California, but I have gotten used to it and we use space more efficiently. Finnish homes generally have smaller kitchens and smaller appliances. You typically don't see these over the top American style kitchens in Finland. You know the ones with the huge counter tops, Island in the center, 6 grills, double refrigerator, huge double oven, stone pizza oven, pots and pans hanging down, etc. I am sure that there are exceptions, but I haven't seen them myself. Sure, it is nice to have all this fancy stuff, but you can still cook just about anything with a smaller kitchen. It just takes some planning, preparation and patience. I never really had an excessive American kitchen, so I am doing just fine with the smaller version here in Finland. I have yet to see a home in Finland with either a "walk-in" closet or a master bathroom. These items are very typical of the American household. I think just about every home in American has a master bathroom, and many have "walk-in" style closets. Sure, they are nice to have, but now that I have moved with to Finland, I realize that they are not necessary. Having more is not always better. However, I do have to admit that they are nice to have, especially the privacy and convenience of the master bathroom that is always separated from the other bathrooms that are used in America for the children or guests. Finnish homes are generally well insulated and have more efficient heating systems. Most Americans homes have central air and heating units where the air is pumped up through the home. These systems are a bit noisy and don't seem as efficient now having lived in Finland for the last year. The more outdated way in Finland to heat a home is to use individual floor heating units they call "batteries". In the newer homes each room has individual floor heating, that can also be controlled individually. It is nice to be able to control the rooms you want, instead of just pumping warm air through the vents throughout the entire home. The heating systems in Finland make no noise and keep the rooms warm for several hours after they are turned off. I guess it makes sense that the systems are more efficient in Finland, considering how cold the winters can get. I wonder why the United States doesn't seem to get past their noisy and clunky central air heating systems? Anyhow, I find many of these differences interesting after having spent a year abroad. WRT white walls, light colours are nicer in the winter and light up the rooms. I suppose painting the walls is now in style. The old way was wallpaper, which especially in an apartment building reduces the echo and, of course, allows some colour or detailing on the walls. There aren't walk-in closets as such but some homes have a vaatehuone (VH in real estate shorthand). Quotation: Finnish homes typically have plain white walls! Nowadays yes, but back in the 70's it was a different story. Also, for an apartment 100 square meters is huge. Something like 85 is ok for a family of four.